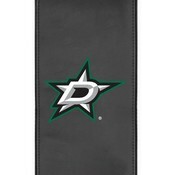 The Dallas Stars Curve Office Chair is a must for any fan who wants to support the Dallas Stars both at home or at the office. Designed with a synthetic leather ergonomic curved back and a breathable mesh seat bottom for maximum comfort. Best of all the logo zips on and off for endless customization. Minimum Overall Height - Top to Bottom: 38"
Overall Depth - Front to Back: 21"
Maximum Overall Height - Top to Bottom: 42"